Benefits Of Trees - How Much Money Does Your Tree Save You? Most of us think we know the benefits of trees, they make our yards look more appealing, they shade us from the hot summer sun, provide shelter to hundreds of species, are good for the environment, and act as a playground for young children to climb on. What most people don’t know is how many benefits the trees in our yards provide to our own home, they air we breathe, and even our energy bills. In this article, we will go over how your yard trees directly affect your home, family, and the environment with real cash examples. Real estate agents have known for a long time that properties with trees sell better than properties without any trees. Recently, research has confirmed this. Numerous studies of real estate and trees show that well-landscaped yards with mature trees and bushes not only fetch higher prices but they sell quicker than houses without trees and shrubs. On average landscaping, especially with mature trees, can increase property values as much as 20%. Even more importantly, Clemson Universe study found that homeowners get a 100% or more return on their landscape investments. 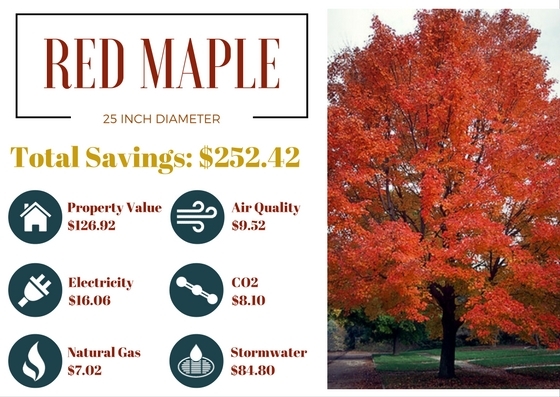 Cash Example Of The Benefits Of Trees: One 25 inch diameter Red Maple will increase your property value by $126.92 annually. Trees are great at shading the sun in the summer and letting the sun through in the winter which can help your electricity and gas bills. By keeping your house cool in the summer and warm in the winter, trees can reduce your energy costs by 30%. If you want to optimize the amount of money you save on your energy bills try creating Windbreaks. Windbreaks are strategically placed conifer trees that create a wall against cold winter winds. By placing them on the north and northwest sides of your property you can save up to 30% on your heating costs. To further save, plant large deciduous trees on the east, west, and northwest sides of your home. This will create soothing shade from the hot summer sun and reduce air conditioning cost by up to 35%. 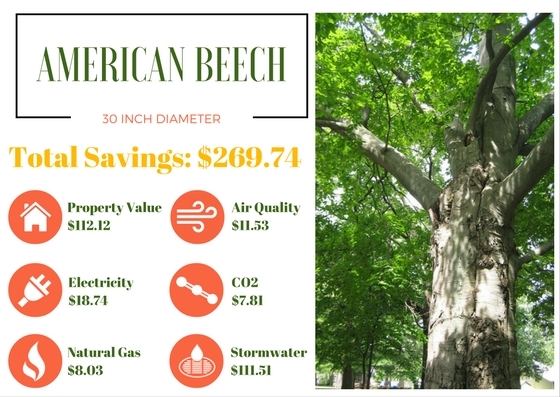 Cash Example Of The Benefits Of Trees: One 30 inch diameter American Beech will reduce your energy costs by $26.77 annually. Air pollution causes asthma, coughing, headaches, respiratory and heart diseases, and cancer. Trees mitigate these health risks by absorbing pollutants (ozone, nitrogen dioxide, and sulfur dioxide), intercepting dust, ash, and smoke, releasing oxygen, and lowering air temperatures. Air pollution causes asthma, coughing, headaches, respiratory and heart diseases, and cancer. Trees mitigate these health risks by absorbing pollutants (ozone, nitrogen dioxide, and sulfur dioxide), intercepting dust, ash, and smoke, releasing oxygen, and lowering air temperatures and carbon. A 30 inch diameter American Beech tree will reduce atmospheric carbon by 1,113 pounds in a year. Urban stormwater pollution is a huge problem. Stormwater runoff washes chemicals and litter from roadways and parking lots into streams, wetlands, rivers, and oceans. In our area, most of this stormwater runoff ends up in the Potomac river. This type of pollution can affect our drinking water, aquatic life, and the health of entire ecosystems. Trees mitigate these effects by intercepting and holding rain on leaves/branches/bark, increasing storage of rainwater in their roots, and reducing soil erosion. Worried about fertilizer compromising your stormwater? Check out our bio-stimulant treatment, a safe type of fertilizer for the environment. 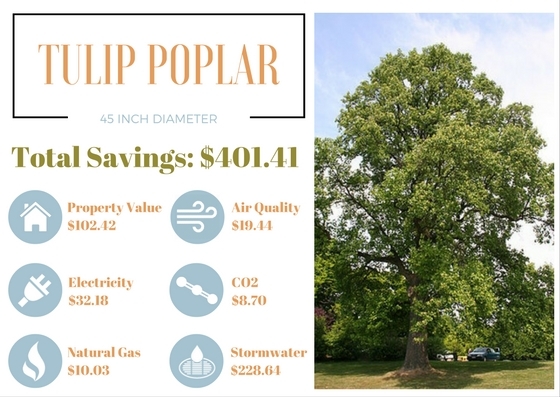 Cash Example Of The Benefits Of Trees: One 45 inch diameter Tulip Poplar will reduce stormwater runoff by 23,095 gallons annually saving $228.64 on stormwater pollution efforts.